I drove up to Bakersfield for the weekend to see my family. 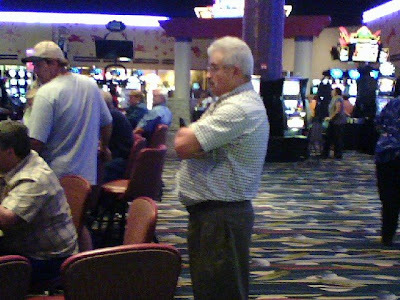 On Saturday, we went up to the Tachi Palace Indian Casino in Lemoore. After dropping a twenty in a "Wheel of Fortune" slot machine, I wandered off to the blackjack tables. I spied a non smoking table that had an opening and slapped my hundred down for some chips. The ladies on either side of me were quite friendly and new the basics of the game. This was good because I don't liked to be asked for my opinion about whether they should hit or not. I feel bad when I tell they should take another card and they end up busting. So, things are moving along at the table with me, the older japanese lady and the middle aged latina woman. Then a younger guy sits down at the table. He is dealt two 9's. The dealer is showing a 3. What does he do? Does he take this nice hand of 18 against the dealer's rather poor card and stop? He decides to split his 9's. And proceeds to bust both hands and therefore losing double the amount of his original bet. After he left the table a few minutes later, I asked the dealer if many people split 9's. "You'd be surprised. I don't know what the reasoning is. But, they do it all the time." A few minutes later and old man sits down and is dealt 2 10's. And he SPLITS them (therefore doubling his bet). He had 20. That's a fantastic hand. But, that's not good enough for him. He ends up with a 17 and 18. So, he could have won his bet with the 2 tens. Instead, he lost on both hands. So, if you see this guy. Follow him around. He is apparently the one they are referring to when they say "a fool and his money are soon parted". 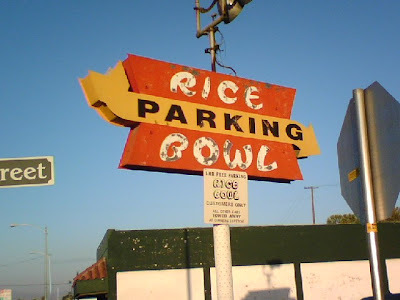 After the ride back to B-field, we stopped at the Rice Bowl for dinner. Battered shrimp, chicken chow mein, bbq ribs, fried rice and egg flower soup. It was as good as always. My favorite chinese place. The next day, Cheryl, Jared, Chelsea and I met my Mom and Willie for breakfast at IHOP. We then walked over to the babies r us and I got some clothes for Jared and Chelsea's baby, who is due next month. And, I got a couple of outfits for my Addie. I wore this really cool "Survivor" buff Cheryl bought for me. And, on my way out of town, I stopped to get a picture of the grape vineyard's with Bear Mountain in the backround. Had a really nice weekend. Your weekend sounds like it was terrific...Does the term battered fish crack you up???? "Battered fish"!!!! That right up there with the old kids' joke, "Why was the chef so mean?" "Because he whipped the cream and beat the eggs (and battered the fish)"
I thought your favorite Chinese food restaurant was "Billy Lee's" in Bakersfield??!! 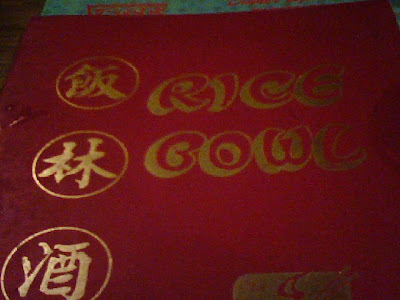 Well, Bill Lee's and Rice Bowl are pretty much the same restaurant.